A far-right group launched a violent attack overnight on migrants staging a sit-in protest on the Greek island of Lesbos, injuring around a dozen people, police said Monday (23 April). 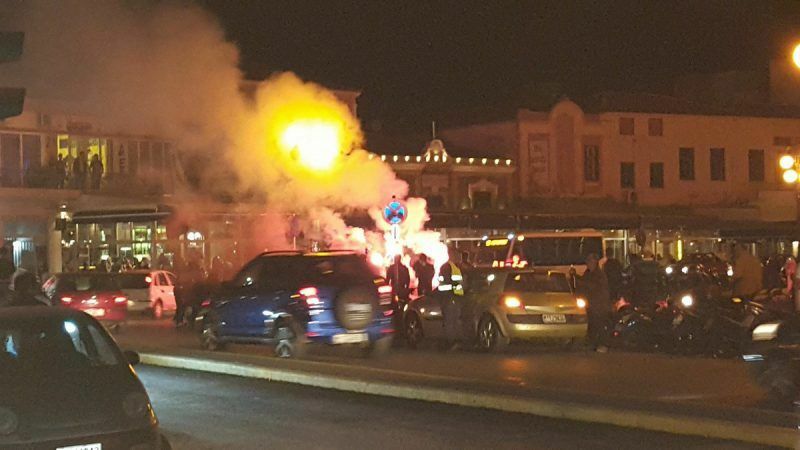 The violence erupted late Sunday after members of the radical Patriotic Movement gathered on the central square of the island’s main city Mytilene, where some 200 Afghan asylum-seekers launched the demonstration last week against their squalid living conditions. Nevertheless, the Greek government on Monday insisted that asylum seekers remain on the islands while their applications were processed. The situation on Lesbos escalated as members of the Patriotic Movement threw bottles and lit flares, shouting slogans like “burn them alive” and “throw them in the sea”. Despite a police presence, tensions spiralled further when leftwing activists arrived to defend the migrants and started fighting with the far-right supporters. The clashes raged all night until security forces used tear gas to disperse the crowd and evacuate the square, forcing the Afghans to return to their overcrowded camps. A dozen asylum-seekers were lightly hurt and had to be taken to hospital, police said. The mayor of Lesbos, Spyros Galinos, accused police of intervening too late, in a letter addressed to Prime Minister Alexis Tsipras and opposition leaders. Galinos also criticised the government’s “inertia and wrong handling” of the migrant crisis, which has “stranded thousands of people in miserable conditions in a city of 27,000”. The prime minister is due to visit Lesbos, currently home to some 6,500 migrants — far exceeding the 3,000 spots available in the camps. More than one million people, mainly fleeing war in Syria, crossed to Greece from Turkey in 2015 after the onset of the bloc’s worst migration crisis since World War II. The influx has been sharply cut since the European Union signed a controversial deal with Turkey in 2016 to send back migrants. However, more than 13,000 migrants are still languishing in camps on five Greek islands until their asylum claims can be processed. This has fuelled despair and sparked protests and outbreaks of violence. Greece, a country of 11 million people, recorded 58,661 asylum applications last year, making it the member state with the highest number of asylum seekers per capita, according to official data. The government ordered asylum seekers to remain on the Aegean islands while their asylum applications are being processed, overturning a court decision that would have allowed them to move around. “Asylum seekers arriving on the islands will be given a note stating that they must remain on site to facilitate the follow-up of their application,” a source from the migration ministry told AFP. That overturned a ruling last week by Greece’s highest administrative court, the Council of State, that had lifted the restriction on freedom of movement imposed on the asylum seekers. Invaders and colonists that’s what they are. Why doesn’t the government do its job and maintain the border!? Why do people allow anarchists to ruin the state?